Crystal Palace XI: Hennessey, Kelly, Hangeland, Dann, Souare, McArthur, Cabaye, Bolasie, Puncheon, Zaha, Gayle. West Brom XI: Myhill, McAuley, Evans, Dawson, Brunt, Morrison, Yacob, Fletcher, McClean, Rondon, Berahino. Thanks for following our coverage of this game. The action continues with a host of live text commentaries on the 3pm Premier League kick-offs, along with our over-arching Saturday football coverage. So what are you waiting, get to da chopper! "It was an emphatic victory, that was clear cut right from the final whistle. "They shower their intent to attack throughout the game, we need West Brom would crack and Bolaise scored and then Cabaye's penalty was the icing on the cake. "As Alan Pardew claps the crowd they will be happy tonight. the Eagles are the up." "It's been a feature of Palace's season. They're so creative and have so much pace in wide areas. "Having that direct option of players that can run at opponents means you are always going to be in the games. "Zaha has responded magnificently to being dropped. Alan Pardew must be delighted and they thoroughly deserve the success they've had at this stage of the season." A much-deserved win for Palace, who were made to work by a stubborn West Brom but whose superiority and attacking intent shone through in the end. West Brom's unbeaten run away from home this season is over and they can have no complaints. Palace move up to third for now. Take a bow, Mr Pardew. Callum McManaman looks to claim what would surely only be a consolation as he cuts inside from the left and shoots towards goal, but Wayne Hennessey blocks. It is the most the Palace keeper has had to do all day. And it is much too little, way too late for the Baggies. "It is no more than Palace deserve, it is no surprise that the wingers Zaha and Bolaise have induced the penalty. "It is ironic that Zaha might have been sent-off not long ago but at the same time he has been elusive. If he had picked the right selection at times they would have scored more. "Palace have been more superior in all departments, West Brom have sat too deep and have not supported their attacking players." Every Palace pass is now greeted with a cheer from the home crowd. It has been a battle, but they are finally able to relax and enjoy themselves. Zaha's work here is done as he is replaced by fellow midfielder Ledley. Yohan Cabaye makes no mistake, putting his shot right of centre as Boaz Myhill dives the other way. Game over. 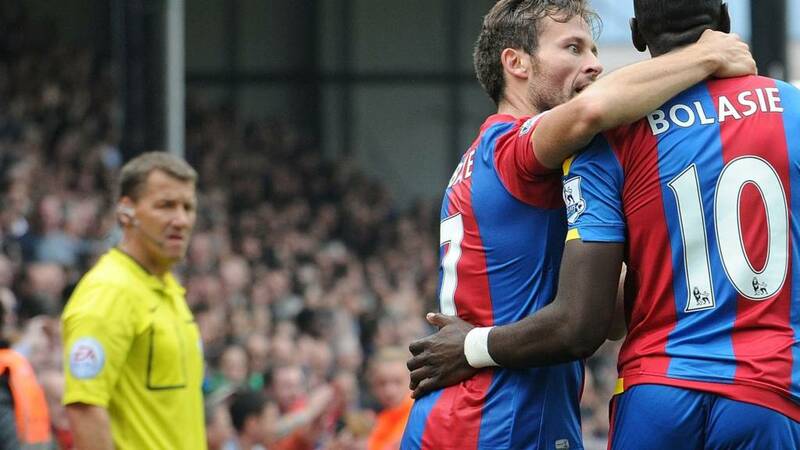 It is the second successive game that Zaha has won a penalty, dispatched by Cabaye. It is also the sixth penalty Palace have been awarded this season. That has been coming. Wilfried Zaha has terrorised Chris Brunt. He beats him down the right and is felled by a loose, diving lunge. Penalty. No doubt. What a waste. It is swung to the near post and hammered away with ease. Following the clearance, there is a flare-up on the touchline between Claudio Yacob and Wilfried zaha that sees the former booked for a bad tackle and the latter yellow carded for his reactive shove. Wilfried Zaha is found near the byline by Jason Puncheon but his low cross towards Yannick Bolasie is cleared by a defender. Soon after, Pape Souare comes close to scoring a fortuitous goal with an attempted cross that dips just over the bar. West Brom are the ones in need of a goal, but Palace look more likely to score again. "Crystal Palace will want the second goal to feel more comfortable, it has been a better performance than last week at Watford. If it stays like this then two 1-0 victories on the trot would be a fine weekend for the manager, players and supporters." Crystal palace have a chance to break but Fraizer Campbell is on his own and faced with three West Brom defenders. The striker checks, lays off to Pape Souare and then charges into the box to try and get on the end of a cross that is a yard ahead of him. We are into the last 10 minutes. No sign of anyone riding to West Brom's rescue yet. There is more energy in the West Brom players now as they chase the ball, but the fact they are using the added zip to chase as opposed to apply pressure to Palace tells you all you need to know. The home side are not home and dry but they are in control. Fraizer Campbell goes down in the box under a challenge, but the crowd's appeal for a penalty is more animated than the players'. Craig Dawson's arms were up, but Campbell made a meal of it. Fresh legs up front for Palace as they introduce one striker for another. West Brom had gone 391 minutes without conceding away from home in the Premier League. You can see why, as they have been very stubborn. But they now have to switch to something more offensive and it is not easy to move up the gears so quickly when you've been coasting in second. It doesn't help that Saido Berahino is off the pitch and Salomon Rondon has been about as effective as a big stick stuck in the ground. As it stands, Crystal Palace are up third in the Premier League table. Not bad at all. "We new it was coming, it was a lovely flighted ball in by Cabaye to the far post, the goalkeeper could not get across and Bolaise flew through the air almost vertical to head into the net. "It is no more than Palace deserve, they are the team that have attacked, they wanted to win and now we will see if there is any reaction from West Brom, having taken their main striker Berahino off at half-time." The Baggies change is immediate as the more attack-minded McManaman replaces Morrison. The deadlock is finally broken! All thoughts of that possible penalty are forgotten as Yohan Cabaye's inch-perfect cross from the left is headed home by the unmarked Yannick Bolasie. It is his first goal at Selhurst Park since Jan 1st 2013 (1005 days ago). It is a deserved lead for Palace. West Brom are going to have to alter their uber-defensive mindset now. I have just seen a replay of that alleged handball against Gardner in the box. Maybe Palace had a better claim than I first thought. The midfielder's arm is out and he does appear to block with it. West Brom can consider themselves lucky. Palace are racking up the corners. Their seventh is swung to the near post but header clear by Dawson. The home side come again but Puncheon's chipped cross into the box is headed away. Yohan Cabaye strikes the free-kick into the wall and immediately appeals for a penalty for a handball against Craig Gardner in the box. The referee waves away the shouts in his direction and justifiably. James Chester is booked after making a mess of clearing with Dwight Gayle applying pressure. The striker gets goal side to claim a bouncing ball and is dragged back. It yields a dangerous free-kick on the edge of the box. West Brom surely can't dig in, in their own half, for the entirety of this second half? Saying that, it has worked for them so far this season. They are unbeaten away, albeit having only scored twice, remember. It is not pretty but it is effective. Palace's plan is a simple one. Give it to Wilfried Zaha. The winger's cross from the right is almost perfect for Dwight Gayle at the near post, but a defender gets in there first to put the ball behind for a corner, which comes to nothing. Soon after, the ball is again fed to Zaha, who beats Chris runt and finds Jason Puncheon on the edge of the box for a shot that rises over the bar. "West Brom need to do better in possession, play with a better tempo and pass the ball better or Palace will dominate the second-half." Jason Puncheon looks to inject some life into the game with a shot from outside the box. He doesn't catch it properly, plus it cannons into a West Brom defender, and a brief hint of excitement evaporates. It didn't take long for the renewed half-time hope of the home fans to be flattened. A couple of fouls, an injury and some slow-paced play from West Brom has taken the edge out of this. At the moment, this game is circling the ring road, going nowhere. "He is a wonderful dribbler sometimes Zaha, he can go both sides and is pacey but his selection of the ball sometimes is questionable"
Wilfried Zaha has beaten his opponent with seven dribbles in the first half of this game - only five players have a higher tally than this in a single Premier League game (not just first half) this season. Yohan Cabaye is down and in pain after turning his ankle attempting a tackle in the middle of the park. Nothing serious, though. A bit of treatment, a ginger retreat to the touchline and he is back in play. The away side get the game back under way and then launch an attack that sees a cross swung over the head of Salomon Rondon and out of play. West Brom have made a change at half-time. And it does little to suggest that attack is on their mind. Midfielder Craig Gardner is on for striker Saido Berahino. Hmm. Well Greg, we're about to find out if the Baggies' approach does end in defeat. The teams are on their way out for the second half. WBA haven't had a shot on target in this match yet - it would be the 3rd time this season that they have failed to attempt one in the first half of a Premier League game if they don't have one between now and HT. They also failed to have a shot on target in the first half of their Premier League games versus Watford and Man City this season. "Albion have been resolute and determined but Tony Pulis will be scratching his head wondering where they will get a goal from. "Palace look more likely, but they have been unable to get a clear chance and their shots have been weak. "It is an interesting game, there has been a lack of ambition from West Brom, they their tactics have worked and they will be happy not to have conceded. "Palace are more exciting from wide positions but they have not made the correct decision at times. If their tempo stays like this in the second-half and West Brom sit back then surely they will create a goal." Palace have had 10 shots at goal (excl. blocked) in this game so far. Only one side have had more in the first half of a PL game this season (Arsenal had 11 v Stoke on Sept 12). This is the most shots at goal (excl. blocked) that Palace have had in the first half of a PL game since they were re-promoted in 2013. A frustrating half for Palace, who have been the better side and had a number of chances, but either fluffed them or found Boaz Myhill in good form between the sticks. West Brom have barely been Palace's half. I'm not sure they can survive another 45 minutes like that. West Brom have the final chance of the half as James Morrison wins the ball in the Palace box and sets up James McClean, but his shot is blocked. Wilfried Zaha is a frustrated man. He has the beating of Chris Brunt every time, except when the Baggies man fouls him, which he has just done courtesy of a clear shove. The referee gives nothing, though. "All the attack is coming from Palace, they have had at least seven goal efforts, but West Brom are resisting superbly. "At the moment Alan Pardew will be the more relaxed of the two manager but he needs break through." Darren Fletcher is down in the box. Tony Pulis' arms are up. They both think it should be a penalty for West Brom for a foul by Brede Hangeland. Jonathan Moss doesn't. In fact, he has a chat with Morrison, no doubt reminding him who is in charge. We are into the final five minuets of this half. A half that has seen plenty of promise from Palace but no end product. Wilfried Zaha has another chance but again does everything right until the finish. He beats Chris Brunt again down the right before cutting inside and firing on goal, but Boaz Myhill's diving save denies him. "They are sitting slightly deeper than the opposition, but away from home to be drawing after half an hour you would consider that satisfactory." Wilfried Zaha has looks as likely as anyone to opening the scoring. He cuts in from the right, into the box, and beats Chris Brunt before firing towards the near post. Boaz Myhill is alert, though, and palms the ball behind. It brings Palace a corner, but in keeping with the half so far, they make nothing of it. Soon after, Jason Puncheon fires a rising drive wide and high after turning his marker on the edge of the box. The final ball is not quite there for Palace. They have been the more positive side and found themselves in some good positions in and around the box but haven't yet been able to capitalise. Dwight Gayle looks to pull a fast one on referee Jonathan Moss by falling way too easily in the box under a legal challenge from James Chester. Moss isn't fooled. Oh, that is a better hit from Yohan Cabaye, who takes the ball down off his chest and strikes a swerving, dipping effort that Boaz Myhill has to palm down before gathering. That's more like it. A good spell of Palace pressure sees a couple of crosses swung in and desperately headed clear before Yohan Cabaye strikes a tame shot wide. Chris Brunt is back on, his nose cleaned up. He probably won't look too pretty in the morning, though. "Jonny Evans going off injured is a setback, they will have to reorganise the back four. But Dawson is comfortable at centre back and West Brom have a tall back four." West Brom try to replicate a free-kick move from the training ground as Saido Berahino moves towards the ball on the right and feigns for Chris Brunt to try and hit it, but Palace are quick to converge on him and prevent the shot hitting the target, also leaving the Baggies midfielder on the turf. He is down with good reason as well, with blood streaming from a busted nose. He'll need to go off to clean that up. Palace are systematically taking the Northern Ireland squad apart! This is a blow for West Brom. Summer-signing Jonny Evans is forced to leave the game with an injury. James Chester - another new recruit - replaces him, going to right-back, with Craig Dawson moving to the centre. The latter may well welcome this to take him away from Yannick Bolasie. The West Brom players aren't happy. They feel they should have a free-kick on the edge of the box after the marauding James Morrison is felled by what looks to be a foul from Brede Hangeland. However, referee Jonathan Moss is pretty emphatic with his two-armed sweeping gesture of 'nothing doing'. "Two shots from Bolasie and one shot from Zaha from Palace, both at Myhill, while West Brom have only had one shot from McClean. All poor efforts so far. "On the evidence of the first 16 minutes Palace are holding sway, they are having the majority of the ball and looking slightly more dangerous." Palace are looking the more dangerous at the moment, but they have yet to produce anything to really hurt West Brom. The potential is there, though, particularly through the pace and trickery of Wilfried Zaha, Jason Puncheon and Yannick Bolasie. Palace step up the pace and put some pressure on the West Brom defence. Zaha beats his man down the right and swings over a cross, which is only half-cleared and the hammered back towards goal by Jason Puncheon for Boaz Myhill to save. It has been a pretty tame 15 minutes so far. However, we do have our first yellow card as James McClean goes through Pape Souare after the ball has gone. It is the first genuinely poor challenge. It got what it deserved. West Brom waste a chance to fashion something down the right as James McClean returns Craig Dawson's throw straight out of play. A minute later, McClean hammers a long-range effort well over the bar. It wasn't the worst effort. Not the best either. It is a sign, though, that having kept it tight for 10 minutes, the Baggies are willing to open up a bit. Craig Dawson is having a bit of a mare. He gives the ball away to Jason Puncheon with a wayward pass but, fortunately for the Baggies defender, the Palace man is unable to fashion anything with possession. Soon after, Wilfried Zaha has space to charge in to and cuts inside his man before pulling his shot from 10 yards wide of the near post. He should have done better. A Couple of corners for Palace. West Brom defend well, though, and keep the home side out. The Baggies clear, but to nobody, as all their players are in their own half. Palace come again as Yannick Bolasie beats Craig Dawson on the left but his low shot is saved by Boaz Myhill. As usual, it is a noisy old atmosphere at Selhurst Park. Pape Souare takes a bad tumble going for a header in the Palace left-back position, but after dusting himself off he is OK to continue. Saido Berahino has the first effort with a chip from the edge of the box that floats over the bar. Reports of James Morrison's poor health have been exaggerated and he takes his place in the West Brom starting XI. While Tony and Alan may well be sitting in a tree later this afternoon, for a couple of hours this lunchtime all pleasantries are suspended. There are three important Premier League points at stake, after all. Palace can go level on points with second-placed Manchester City with a win, while West Brom will move up to ninth with a victory. "His performances as a manager have been top drawer, he made a very difficult job at Newcastle go well. "He's had a bit of money to spend at Palace but the way they are playing and creating goals is a breath of fresh air." "If on a scouting mission, Jonny Evans' performance against Aston Villa was that good I'd wan him in my team, he was that good. "Maybe he lost his way with Louis van Gaal but Tony Pulis is similar to Sir Alex Ferguson, maybe his simplicity of management suits Evans down to the ground." "Nobody at Crystal Palace should be under any illusions about the thanks they owe Tony Pulis. "From rock bottom to mid-table, in the twinkling of an eye the Welshman ensured that the foundations of success were laid. "What Alan Pardew has achieved in an equally short space of time is perhaps even more impressive. Palace have every right to think that they can qualify for Europe with what must be their finest team in more than two decades." Mark Lawrenson thinks this match will end in a1-1 draw. "Tony Pulis laid the foundations for this Palace success and his main aim on his return to Selhurst Park will be to avoid being beaten," reckons our football expert. Take on Lawro - and football fans from across the world - by having your say in all of this weekend's fixtures in ourfootball predictor game. This is, of course, a return to Selhurst Park for Tony Pulis, was named Premier League boss of the year in 2013-14 after guiding Palace out of the relegation zone and up to 11th. However, he left the club the following season after growing frustrated at the club's inability to land key summer signings. Coincidentally, this is Pardew's 26th league game as manager of Palace - matching the number of games Pulis had in charge of the club. Palace have won 14 games and scored 36 goals under Pardew, compared to 11 wins and 26 goals during Pulis' tenure. The cheerleaders are strutting their stuff, the eagle has taken its place on the crossbar. This can mean only one thing: kick-off is looming at Selhurst Park. But wait... no sooner have I given you the team news there is the smell of a potential change in the air. Our summariser Tony Brown has noticed James Morrison leaving the Albion warm-up early, holding his calf. "Only one change for WBA, with Gareth McAuley fit to replace Jonas Olsson, who was injured during Monday's defeat by Everton. "Record signing Salomon Rondon reportedly hasn't trained since that game due to a calf injury, but is still selected to start." Crystal Palace make two changes with James McArthur and Wilfried Zaha stepping up from the bench in place of Bakary Sako and Joe Ledley. For Zaha, this is rewarded for his man of the match display at Watford last week. Crystal Palace starting XI: Hennessey, Kelly, Hangeland, Dann, Souare, McArthur, Cabaye, Zaha, Puncheon, Bolasie, Gayle. West Brom starting XI: West Brom: Myhill, McAuley, Evans, Dawson, Brunt, Morrison, Yacob, Fletcher, McClean, Rondon, Berahino. You can see why Tony Pulis is a supporter of Pardew's credentials. He was already a Palace hero before he rocked back up at Selhurst Park last January and took them from the relegation zone to a record top-flight points tally and a 10th-placed finish. He has done little to harm his standing with four wins from seven matches this season, including victory over Chelsea (although most teams seem to be managing that at the moment). Try this one on for size... Alan Pardew: England manager. Chances are you'll fall into two very different camps in your response to such a suggestion; firm agreement or utter revulsion. This is Pardew's way - he is a Marmite manager, earning backers with his ability but also creating haters through his perceived personality. It would be safe to say that West Brom boss Tony Pulis, the man who has proposed Pardew's elevation to the national job, is one of the former.